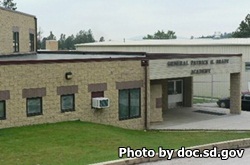 Patrick Henry Brady Academy is located in Custer South Dakota. This facility treats juvenile males between the ages of 14 and 18. Brady Academy uses a multi pronged approach to treat offenders, using counseling, skill development, mentoring, and substance abuse treatment. Juveniles are housed in a dormitory setting with up to 48 other youths. The majority of offenders treated here are non-violent and low risk, juveniles who act out, or fail to follow directives are removed from the program and placed into a more restrictive correctional environment. Patrick Henry Brady Academy offers religious services once per week, attendance is optional. Mental health services, medical services are provided on site, with serious ailments being treated at the regional hospital. Youths are provided individual and group counseling based on the assessments made when entering the program. Education is provided to all offenders and Brady Academy is an accredited high school where patients can earn a GED. The visiting hours for Patrick Henry Brady Academy are currently unknown. If you know information about visiting a juvenile at this facility please leave a comment below.